The game of cricket has a known history spanning from the 16th century to the present day, with international matches played since 1844, although the official history of international Test cricket began in 1877. During this time, the game developed from its origins in England into a game which is now played professionally in most of the Commonwealth of Nations. 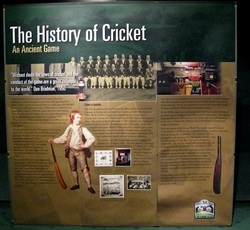 No one knows when or where cricket began but there is a body of evidence, much of it circumstantial, that strongly suggests the game was devised during Saxon or Norman times by children living in the Weald, an area of dense woodlands and clearings in south-east England that lies across Kent and Sussex. In medieval times, the Weald was populated by small farming and metal-working communities. It is generally believed that cricket survived as a children's game for many centuries before it was increasingly taken up by adults around the beginning of the 17th century. It is quite likely that cricket was devised by children and survived for many generations as essentially a children’s game. Adult participation is unknown before the early 17th century. Possibly cricket was derived from bowls, assuming bowls is the older sport, by the intervention of a batsman trying to stop the ball from reaching its target by hitting it away. Playing on sheep-grazed land or in clearings, the original implements may have been a matted lump of sheep’s wool (or even a stone or a small lump of wood) as the ball; a stick or a crook or another farm tool as the bat; and a stool or a tree stump or a gate (e.g., a wicket gate) as the wicket.A number of words are thought to be possible sources for the term "cricket". In the earliest known reference to the sport in 1598 (see below), it is called creckett. The name may have been derived from the Middle Dutch krick(-e), meaning a stick; or the Old English cricc or cryce meaning a crutch or staff. Another possible source is the Middle Dutch word krickstoel, meaning a long low stool used for kneeling in church and which resembled the long low wicket with two stumps used in early cricket. According to Heiner Gillmeister, a European language expert of Bonn University, "cricket" derives from the Middle Dutch met de (krik ket)sen (i.e., "with the stick chase"), which also suggests a Dutch connection in the game's origin. It is more likely that the terminology of cricket was based on words in use in south east England at the time and, given trade connections with the County of Flanders, especially in the 15th century when it belonged to the Duchy of Burgundy, many Middle Dutch words found their way into southern English dialects.